This is a portrait of a double sculpture located just off Canberra's King's Avenue. Prime Minister John Curtin and then Treasurer Ben Chifley (later PM) are walking from the Hotel Kurrajong to the old Parliament House. It is during World War II. These sculptures are a little larger than life size, and look very real. 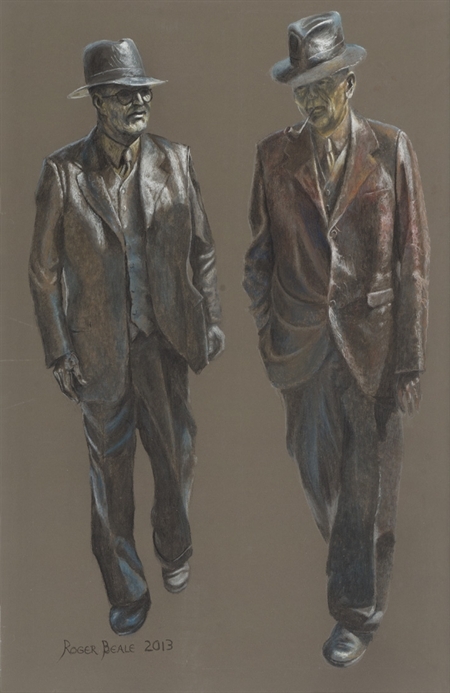 The drawing is a portrait of the sculpture - so it aims to capture the patina on the bronze, while still giving a sympathetic sense of these two great war time leaders.